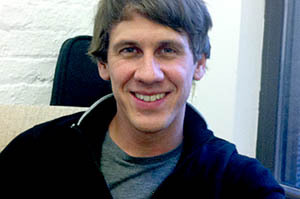 Dennis Crowley, the co-founder of Foursquare, has been thinking about location for a long time. He built Dodgeball in 2003 and sold it to Google two years later. With Foursquare, which he built in 2009, he returned to his idea of building a location-based service that helps people explore the world around them. The company is now up to 15 million users with more than 100 employees and is poised to move into a cavernous new office next month. 2011 has been about learning how to do this job. With Dodgeball, it was just Alex (Rainert) and I, and we weren’t really managing any people. With this we’re realizing that we’re creating a company from scratch that has its own culture, and 100 employees. It’s about creating the structure, the processes, the culture and the work ethic and stuff like that. It’s challenging to do especially as the company keeps growing. That said, I’m really satisfied with the way the company’s grown. We haven’t had a lot of problems, but we’re working hard to make sure the company doesn’t break every couple of months. We have to maintain the right ratio of team members — that there are enough product managers to deal with the engineers, and enough designers, community teams and the marketing folks. Things usually work fine and then you add a couple of folks and then things slow down a little bit or there might be too many cooks in the kitchen. As a company gets bigger, the chain of communication changes. It’s up to us to make sure we can be as transparent with 100 people as we were with 20 people. And ensure that really good ideas that come from someone that just started can make it as quickly into the product as we’ve been able to do in the past. We have a lot of ex-Googlers here and we’ve taken a lot of the Google culture that we really like and applied it to Foursquare. For example, people do weekly snippets and we have a pretty strong review process and pretty strong interview process. And we take management techniques from a lot of our investors like Ben Horowitz, Bijan (Sabet), and Albert (Wenger). Now we’re going to go from 100 employees to whatever the number eventually will be. We’re about to move into a new office space which is considerably larger than the one we’re at now. We have plenty of room to grow, and the new space is going to solve a lot of the infrastructure problems we have at our current office. But just because we have more than 100 people doesn’t mean we’re out of the woods. As we get 10 more people, we have to adjust, as we get 20 more people, we’ll have to readjust. I think one of things we need to focus on next year is now that we’ve built a lot of the stuff, we have to find all the interesting ways they work together. The Foursquare app is great but there’s a lot of things we can tweak to make it significantly better, faster, easier to use. I look at the changes that Twitter has gone through recently for the product. They’re looking at it like, hey we’ve hit the point of 250 million users and we need to change the way people think about Twitter, so the new people understand it as well as the early adopters. We’re not quite at that stage yet but we can look around we can already see this happening in the app. People know us for check-ins but with the data, we want to push people more toward the recommendation engine and the way to do that is make that prominent and a big part of the app. Check-ins will always be a big part of what we’re doing but there are other parts of the app that are extremely valuable and we almost hide them a bit and so we want to pull things out and position them for users in different ways. You’re going to see different types of activity coming out of Foursquare. Our eyes re on what Facebook and Google are doing and they’re probably the two most dominant players in location besides us right now. And when you look at our class of startups, like the Instagrams and the Paths, it’s interesting that Instagram pushes check-ins to us and they’re using our location platform to power their location-based photos. We’re playing a very important part in their ecosystem. Looking at the big challenges, it’s about growing our user base. We’re at 15 million users now and the next stop is 20, 25, 50 million users. We just want to continue to be able to compete with the bigger names in the space. We have a nice built in advantage because we’re all about location. That’s been our focus from the beginning and now that we’ve grown a little bit, a lot of people know the Foursquare brand, even if they don’t use the product. That’s the big difference from last year to this year. People think of Facebook as web, social, status updates and photos and people think of Google as search, Gmail and maps. And here we are off to the side but we’re all about location, deals, check-ins, recommendation, everything about place. That puts us in a really nice position.